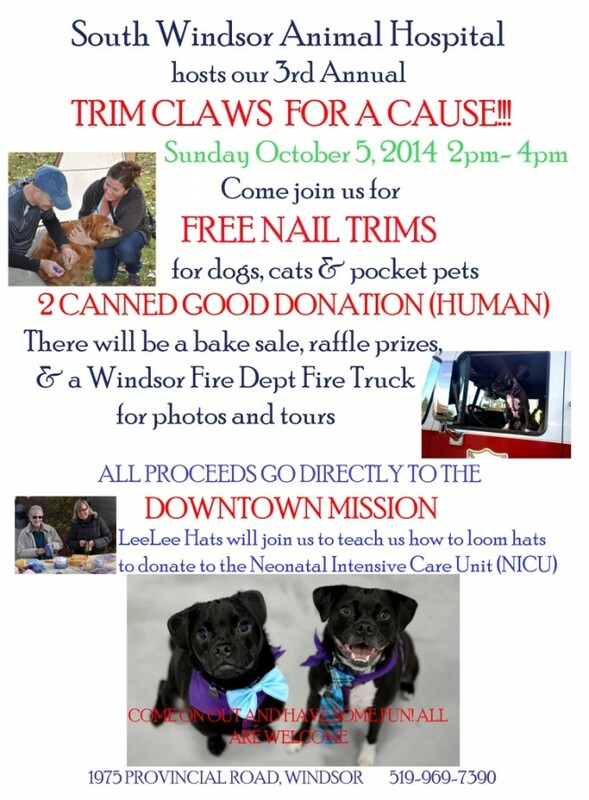 South Windsor Animal Hospital will be hosting their 3rd annual TRIM CLAWS FOR A CAUSE event on Sunday October 5 2014 from 2pm-4pm. We will be providing free nail trims to dogs, cats and pocket pets in exchange for a donation of 2 human canned good (or monetary donation). Dogs should be on leashes or in carriers, cats and pocket pets should be in carriers. We will be having a bake sale, raffle prizes and a Windsor Fire Dept Truck will be here for photos and tours. Bring the whole family out for fun!